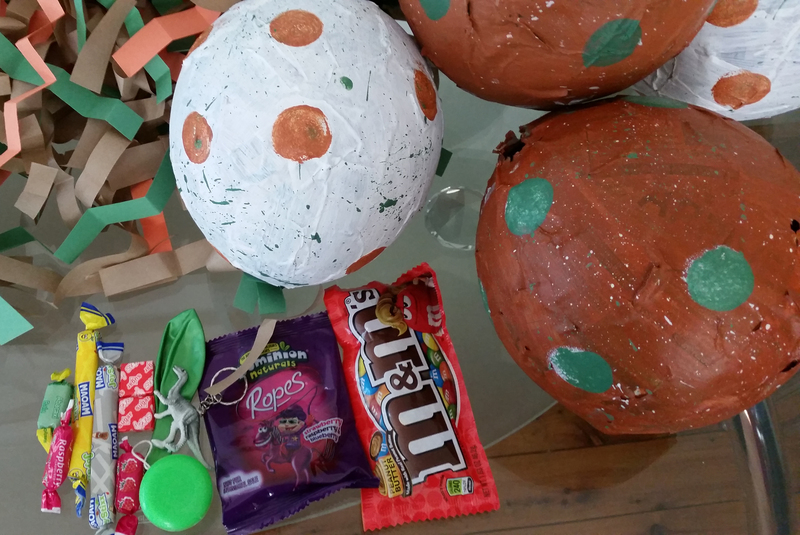 We had my boys’ Birthday Party last week and they wanted to go for a Dinosaur theme. 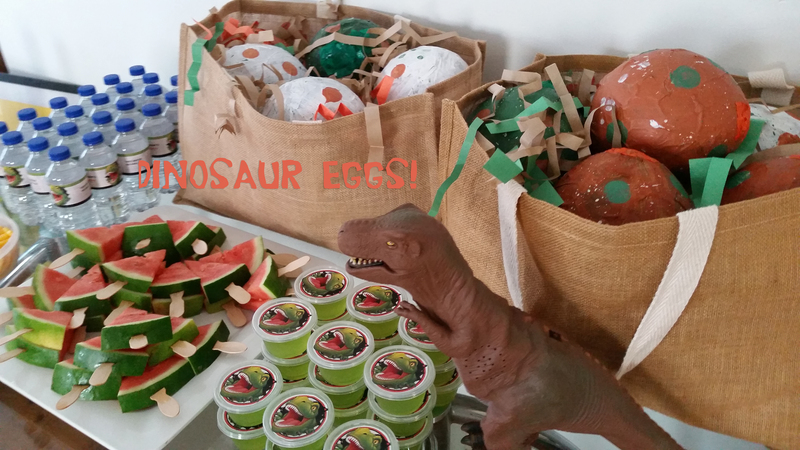 In the process of organizing everything I decided to try making ‘dinosaur eggs’, fill them up with lollies and give them out as party favors. PAPER MACHE MIXTURE: ( 1 part flour, 3 parts of water mixed in the blender). 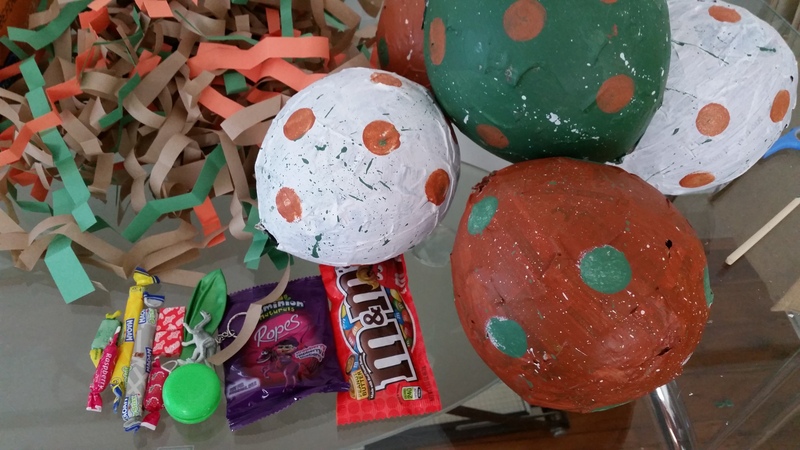 And used Glue/water instead, because I needed to make bigger sized eggs and they also needed to be a bit sturdy, so they could hold lots more of the goodies inside. You could still use the traditional recipe if its easier for you, but you might need to add more layers of paper, and also plan time ahead as they will take longer to dry. Mix 1 part of glue with 1 1/2 parts of water until you have a smooth paste. Cover the work area as this is going to be a very messy job. 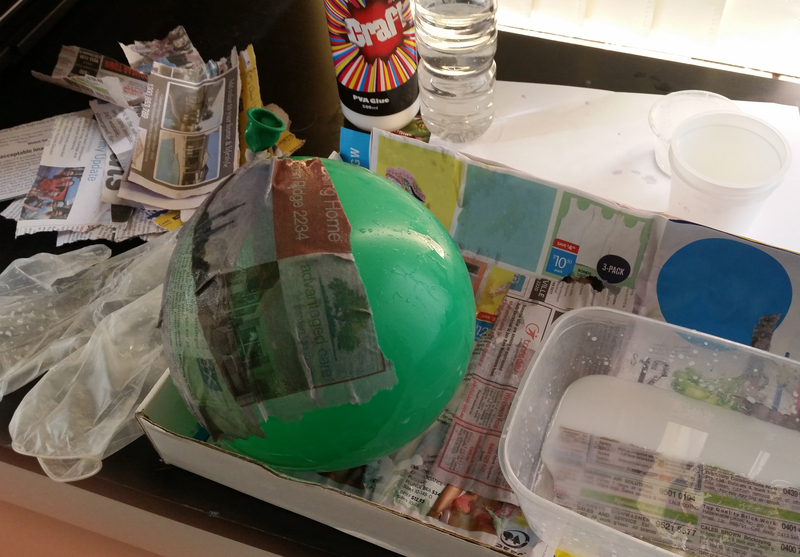 I am using a cardboard board to keep the mixture from running everywhere and plastic cups to hold the balloons. 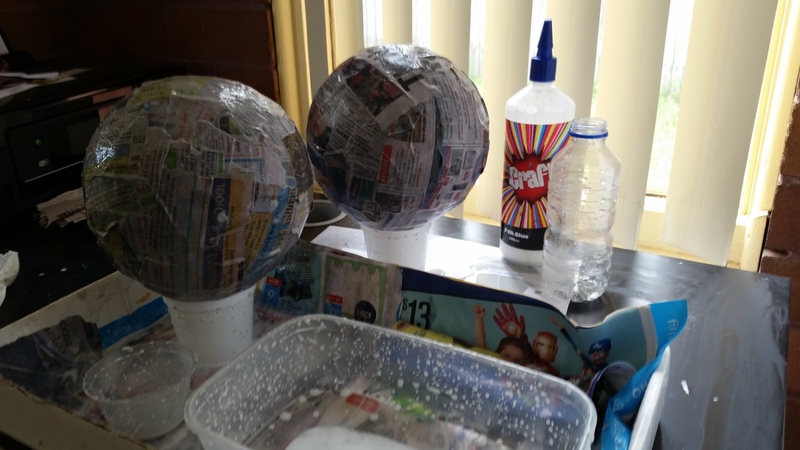 Take a strip of newspaper and dip it into the paper maché mixture and cover the balloon , overlapping the strips in different directions until the balloon is entirely covered. 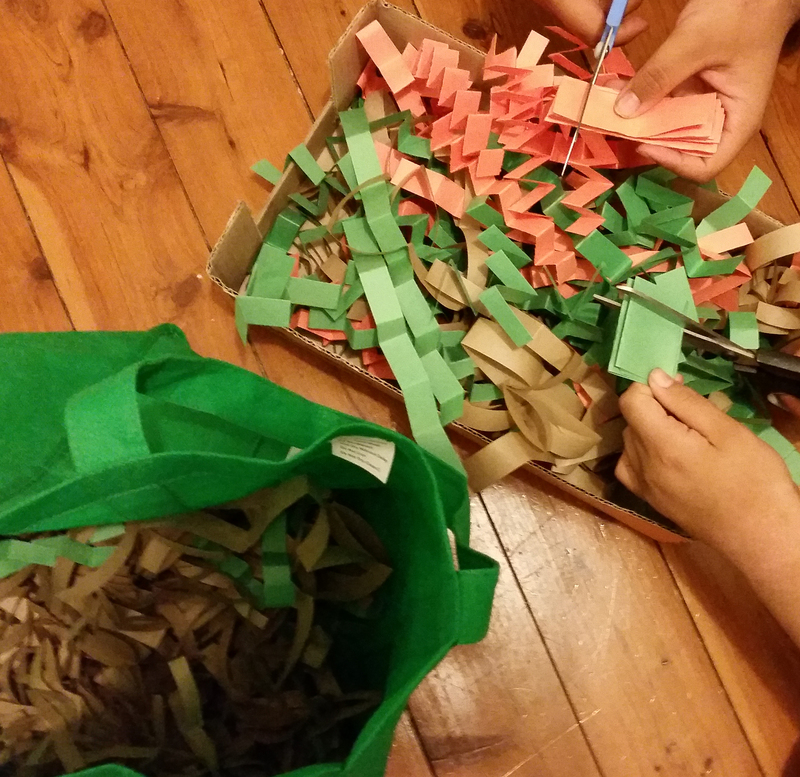 (I left a small round open bit where the knot is so I could use it later to fill the balloons. 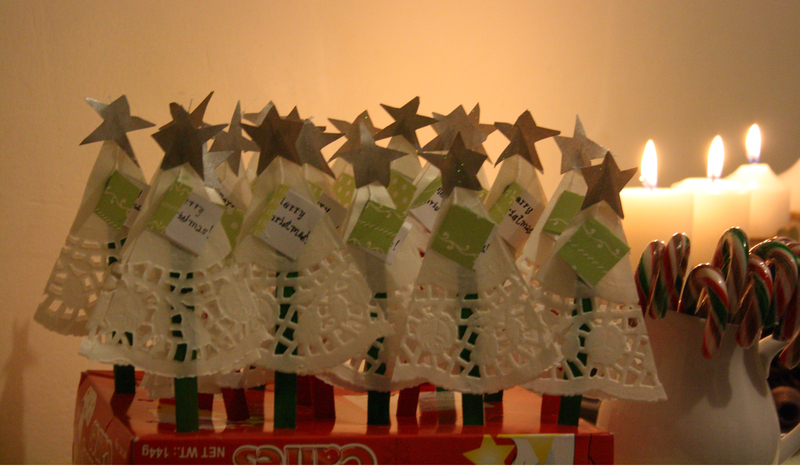 Once covered, hang them outside to dry for 24 hours. I hanged mine outside on the clothing line, but any indoor ventilated area is okay as long as you cover the floor with more newspaper, as they will drip. After drying, check if there is any weak spot that might need and extra strip or two and re-hang them for extra hours. 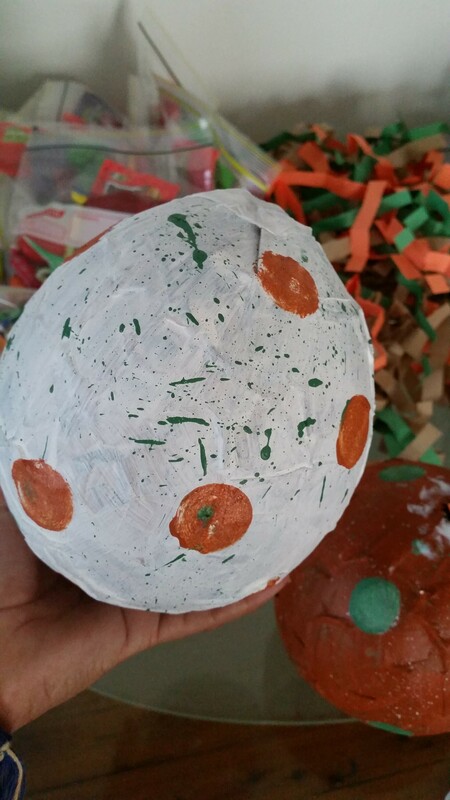 Once completely dry, the egg can be decorated. 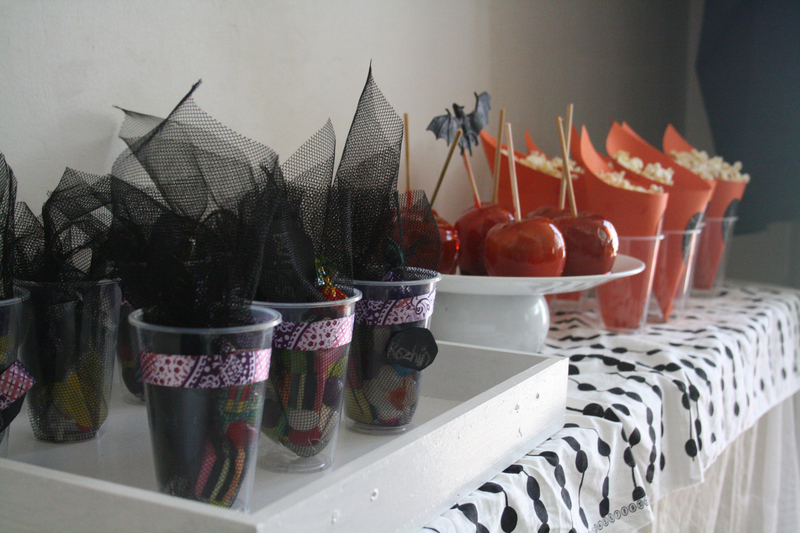 I used Poster paint in 3 different colors: one for base, one for sprinkles and other for the round spots. 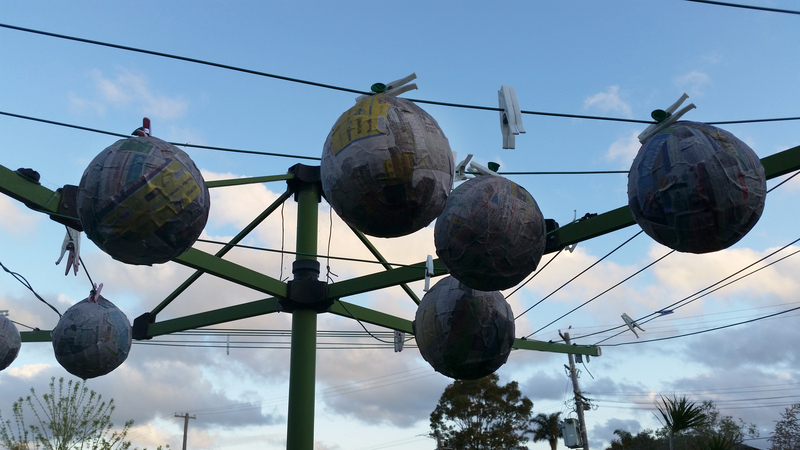 Let them dry overnight, pop the balloon ,they will easily detach from the egg. 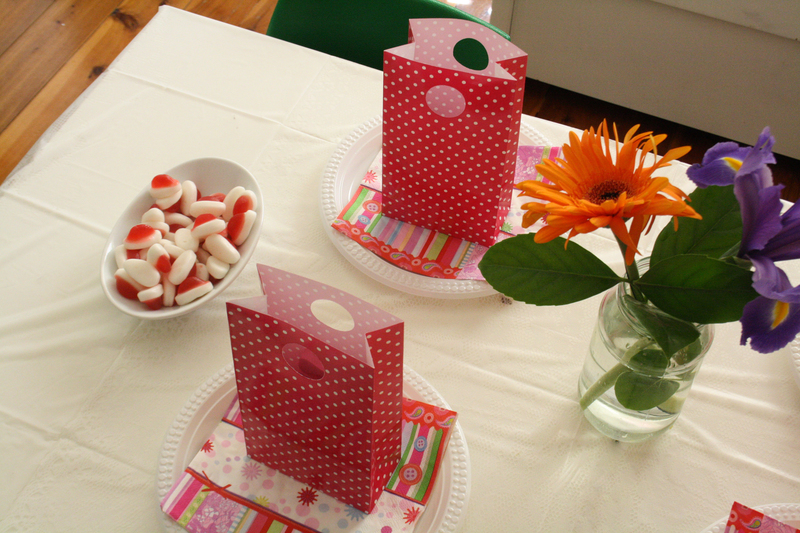 Fill the painted eggs with lollies, toys , balloons, or any goodies you wish. I also used colorful paper cut in thinner stripes to make the egg more interesting. For some of the goodies, the small hole in the balloon was not big enough for it, so I made a small cut along the hole to be able to insert the bigger goodies. Once the egg is filled, close it using a small piece of matching paper ( I used crepé paper). And there are ready to RAWRRR!! 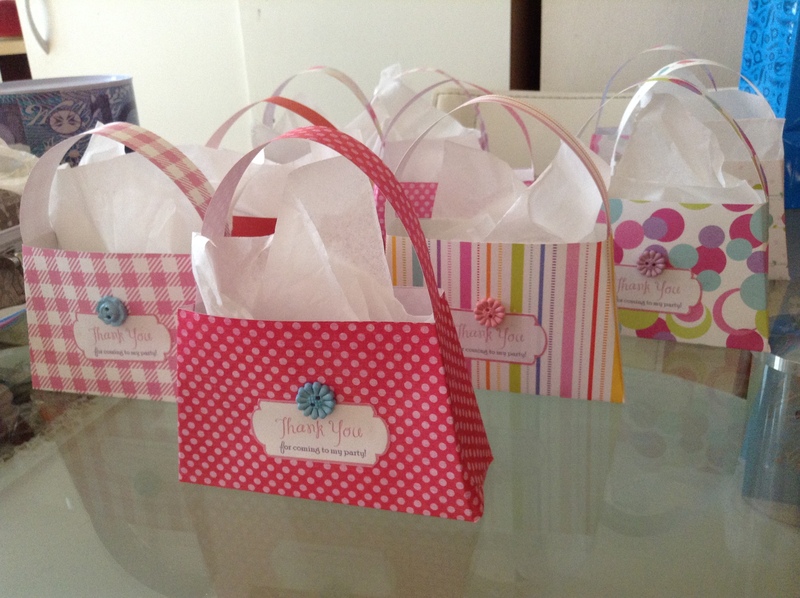 Any leftover paper maché mixture can be stored in an air-tight container in the refrigerator to be used the next day. 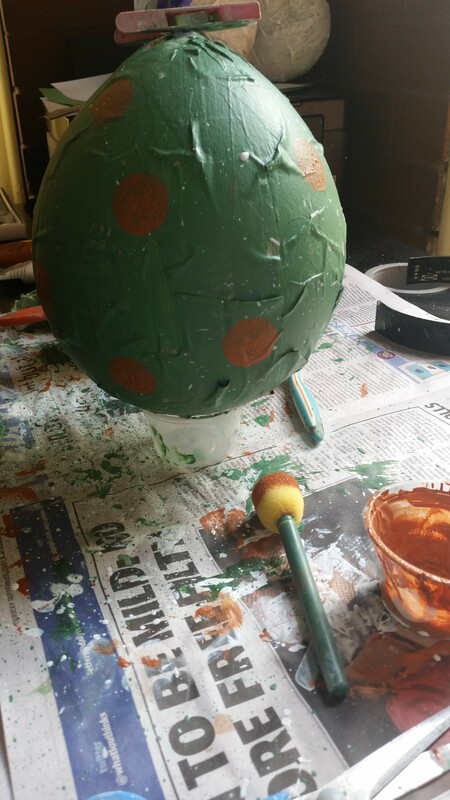 Make sure that the balloon knot is very tight otherwise the balloon will deflate before the paper mache is dry and all your work will be lost. 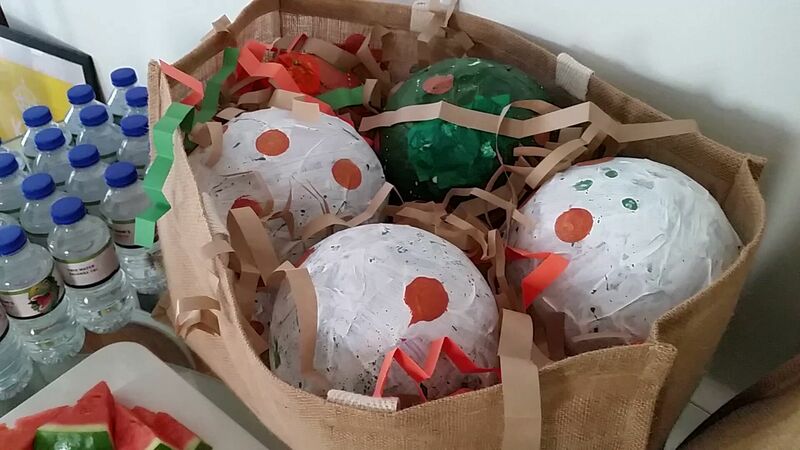 Try to take the balloon out of the eggs as soon as they are dry and painted , if you leave them inside for long, the balloon will shrink, putting pressure on the paper mache. Place them somewhere “safe” as they can crash easily. I read this article and found it very interesting, thought it might be something for you. 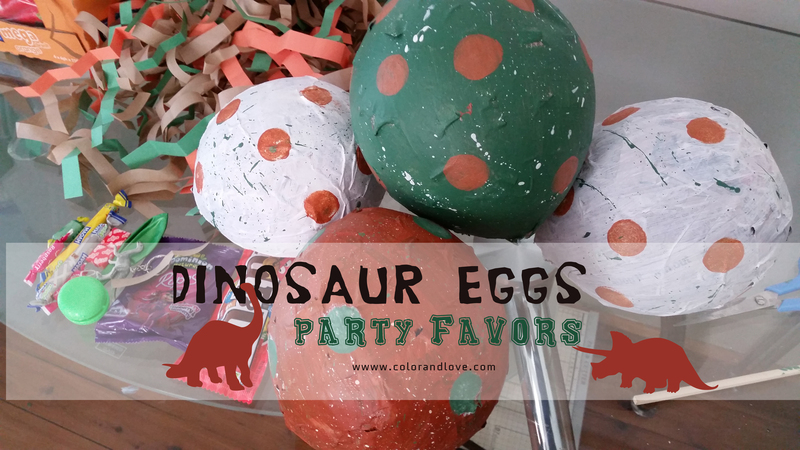 The article is called Make your own Dinosaur eggs – Party favors.and is located athttp://colorandlove.com/make-your-own-dinosaur-eggs-party-favors/.